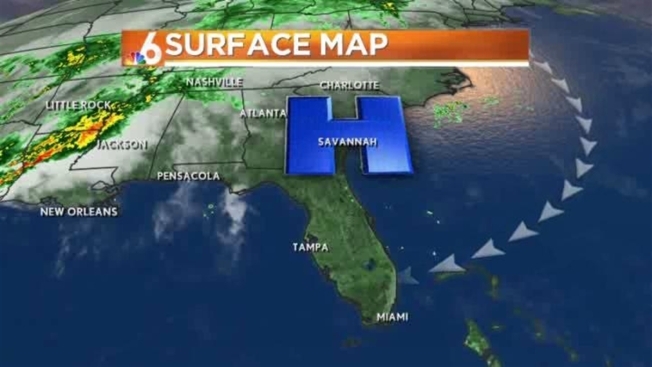 High pressure remains in place across Georgia, providing South Florida with a mainly dry and breezy weather forecast Thursday. The steady coastal breeze will keep the rip current risk elevated through the afternoon. Conditions will be partly sunny and breezy, with highs around 86. Lows will be around 77. Humidity will rise Friday and into the weekend, ahead of a cold front that should arrive Saturday night. The next cold front, slated for Saturday night, will be relatively weak and only bring a slight chance for showers into the weekend. Look for breezy weather to return by Sunday, along with lower humidity.